Via Ferratas in the Dolomites. Last week I took some leave and went with three friends to the Dolomites intending to climb some via ferratas. Basically, a via ferrata is a steel cable that is fixed periodically along a steep rock route. Climbers can secure themselves to the cable, limiting any fall. We stayed in huts high on the mountains. These are less a garden shed and more like very basic small hotels and they are very good. When we arrived, we found rather more snow in some places than we expected so we had to fall back onto plan B at times. The first climb we went up and returned on the same via ferrata. The second climb we had planned to go up and along a ridge-line but there was too much snow. As we had not taken our winter kit with us, we just hopped off part way, went around to the other side and back down. It’s better to have a plan B rather than drive on with a fixed idea that is not doable for some reason. On the third route when we got above 3000 m we found a lot of snow again on the northern slope so we modified our return route. We saw few people because it was early in the season and because of the snow. But we did come across one group that stuck rigidly to their plan for the day. We arrived back at the hut at 6 p.m. in time for a beer and a meal. They returned after midnight having had a bit of an epic and only getting 50 m further. It was a good trip with great days on the mountains. The views were stunning; the people were friendly; the food was good and the beer was excellent. Unfortunately I returned from the Dolomites with Lyme disease. Lyme disease can be transmitted by ticks. I must have had hundreds if not thousands of tick bites in the UK and abroad and this is the first time I've reacted. If you’re bitten, you may develop redness around the bite followed by flu-like symptoms. You should see a doctor as soon as possible if you suspect you have contracted an illness related to the bites because early antibiotics are essential to avoid prolonged infection. The best made bin store in the west! ....... In the North West, that is. This last week the volunteer centre at High Wray Basecamp has been full of the sound of chiselling, sawing and hammering. Along with our woodland ranger Richard, we've been hard at work with our second National Trust green woodwork working holiday. Last year we made a new woodstore for Basecamp - this years project is the glamorous sounding recycling store for the grounds of Wray Castle. So, a bin store. Could have been a hard sell for a green woodwork project, but there's good reason for making a really good job of it. The recycling at the castle is currently stored in a small, damp and difficult to get to stone tunnel round the back of the castle. This inaccesibility meant the big recycling trucks were having difficulty getting to it, so we needed a new location that was easier to get to. However, this new location is close to the front of the castle - which means our timber framed shed needs to look good! We can also use the prominent location to put some information up about how it was built and who built it, making a talking point about it and making sure the volunteers are credited. The Basecamp workshop in full swing later in the week when the weather wasn't so kind ..
Towering over the North West shore of Windermere – Skelghyll wood can be spotted well before arriving. The give-away? 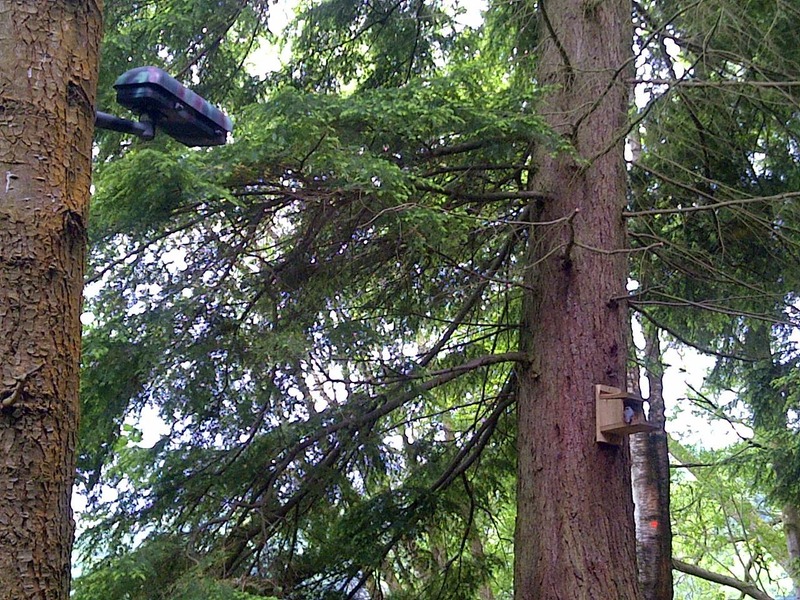 Some of the tallest conifer trees in Cumbria and the tallest of their kind in England. You’d be forgiven for not seeing the majestic wood as you negotiate busy traffic and sharp bends in the road to Ambleside. But once seen, the wood and its colossal trees will stand out for miles around. Unlike the tall trees of other continents these can be reached in only a few minutes walk from Waterhead, just south of Ambleside and close to public transport links including the ferry. Skelghyll wood is already very popular with walkers and cyclists travelling from Ambleside to Troutbeck via the very popular viewpoint called Jenkins Crag. 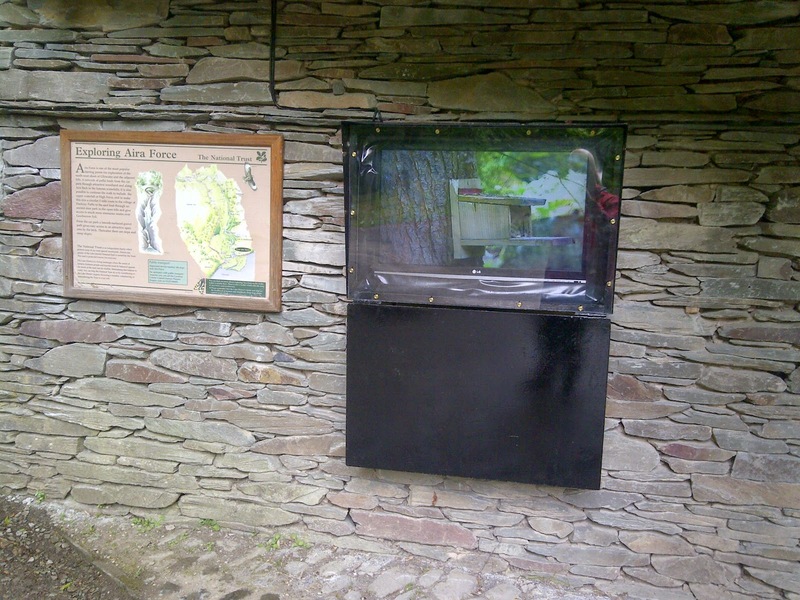 Visitors to Stagshaw gardens at Skelghyll wood will have already seen a glimpse of the tall trees, but now we’ve opened up a brand new path to enable visitors to marvel, up close and personal at the Champion trees. 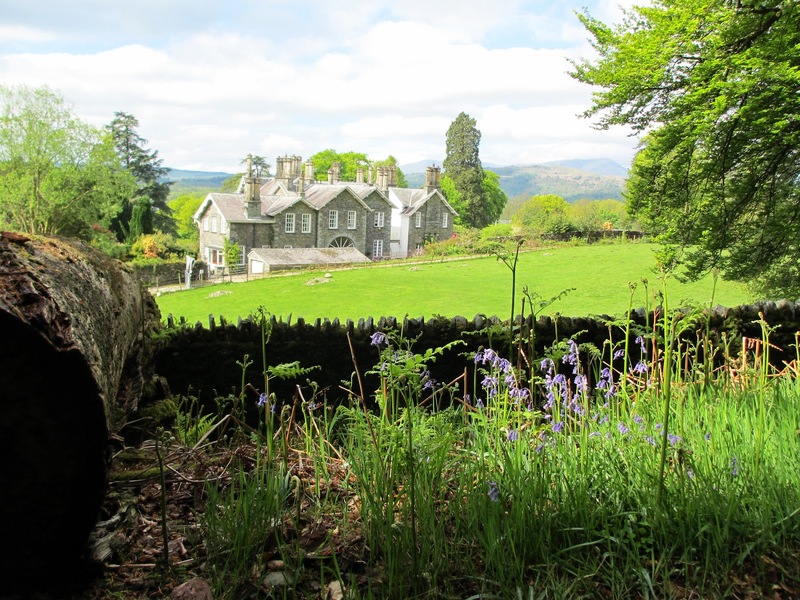 The Victorians, famous for their plant hunting had a big influence on Skelghyll wood and planted over 150 specimen conifer trees from all over the world including South and North America, Japan and Europe. Some of these have trees have thrived on the lush wooded slopes and survived harsh winters and storms to become over 50 meters high – higher than 12 double-decker busses stacked on top of each other. The tallest is a Grand fir measuring 58 meters (190ft) high making it the tallest tree in Cumbria and the North West, and the tallest Grand fir in England. Other Champion trees found in the wood include Douglas fir, Wellingtonia, Western Red cedar, Hondo spruce and Blue Colorado spruce, all of which are the tallest of their kind in Cumbria. The planting vision set out in 1860 by the Victorians can finally be appreciated and the new Champion Tree Trail is a ‘must-see’ for anyone interested in trees, history or simply being in wonderful places that make you realise that nature is capable of huge things. Although the path is now open the story has only just started. We want to plant what will be champions of the future and to add to the new trail, making it a favourite place for generations to come. 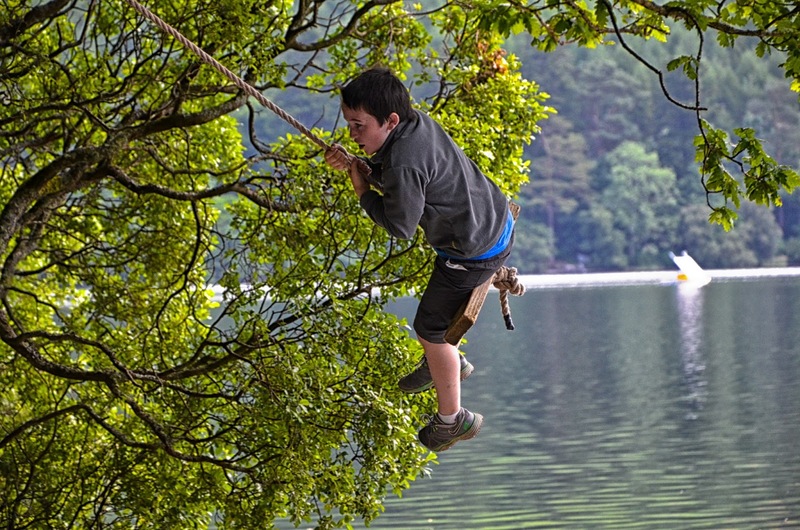 The adventure for you and your family can begin in Waterhead and simply walking to Skelghyll wood or parking at Stagshaw Gardens car park nearby where the start of the new trail is located. 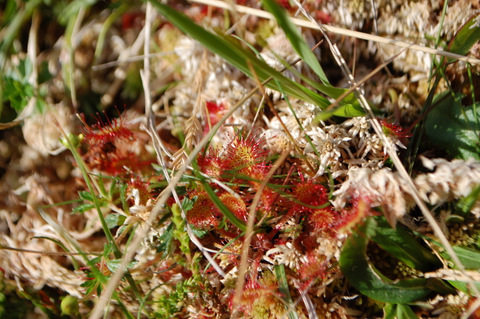 Take 45 minutes to stroll in sturdy footwear along the route taking advantage of picnic benches to marvel at what nature can do, with a little help from Victorian plant hunters. Beetles like this Longhorn (Rhagium mordax) love Skelghyll Wood too! Enjoy your walk and don’t forget to pack a picnic! No-one likes sitting in front of the computer when the weather's this good so this blog post is shorter than usual! On our NTsouthlakes Twitter page we've recently re-tweeted a couple of videos that give a quirky view of things close to our hearts. If you haven't seen them already here's a chance to view. and the second is how else you can get around in the Lakes without using the car. Enjoy the sunny weather - even better by bike, bus or boat or on foot! A tail ends this tale! I mentioned in an earlier post that we had sawn up an old tree that had washed ashore by the lake. The logs were taken back to my house and I am slowly working on them in the evenings with a chainsaw and chisels. It will take some time and patience but eventually we will have some more seating for the amphitheatre beside the Trust shop. The pictures will give you some idea of what I hope to achieve. And, just to prove that I do sometimes follow my own advice and look down when I am out and about, I’ll post the following pictures! Common Spotted orchid: The most common of all UK orchids that you are likely to see. verges, hedgerows, old quarries, sand dunes and marshes. Wild thyme: The scent of hot, summer days. small creatures such as insects makes up for the deficiency. For some time now I’ve also been doing some renovation work on our house in town. Most recently, I’ve been doing some painting. 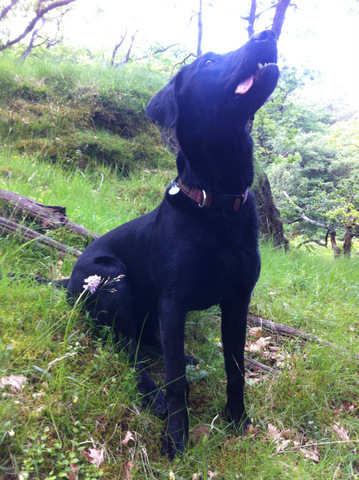 Daisy was with me and, in her usual fashion, had to be closely involved whenever she saw a chance! 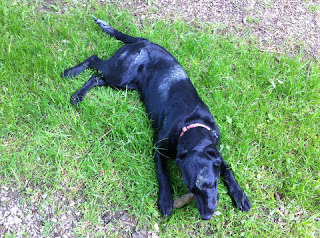 She did manage to pick up some paint stripes on her coat! Head, back, hip and tail stripes! Painting and decorating? It’s boring! Aira Force red squirrel trail. The red squirrel was once a common site throughout the whole of the UK but it is now an endangered species with only about 20,000 left in England and Wales, mostly in Cumbria and Northumberland. Aira Force is well known for its waterfall and specimen trees but it has also become a place of sanctuary for our native and increasingly rare red squirrels. 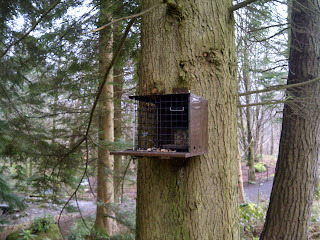 Working in partnership with the Penrith & District Red Squirrel Group, the National Trust has created a safe haven for these enchanting creatures by introducing a red squirrel trail, with strategically placed feeders, on the footpaths up and down the falls, thereby giving visitors the opportunity to glimpse red squirrels in the wild. The decline of reds is directly attributable to grey squirrels which were introduced from North America in 1876 and whose population has exploded to in excess of 2.5 million. The bigger grey displaces red squirrels over time by out competing them for food but more critically as a carrier of the highly contagious Squirrelpox Virus (SQPV) to which they seem immune but is fatal to red squirrels. 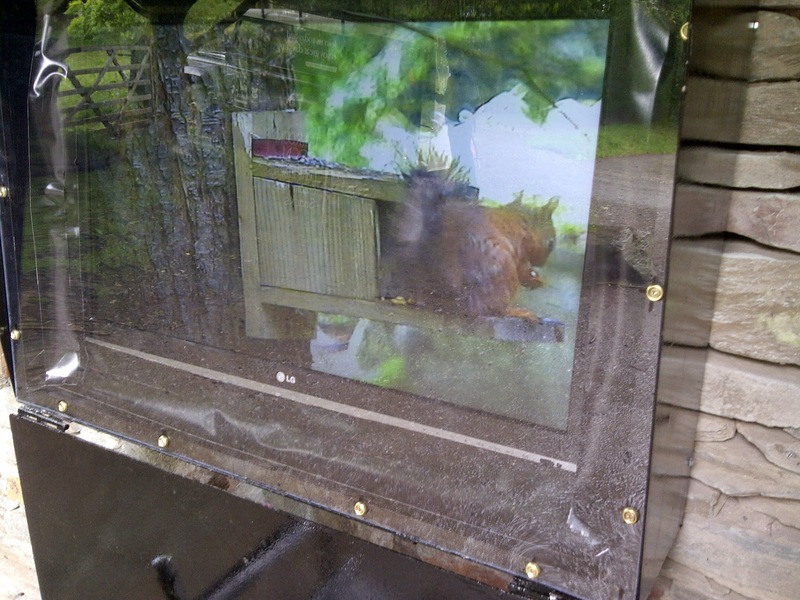 With very kind donations from Garfield Weston and the John Speddan Lewis Foundation we have been able to install a couple live cameras focused on squirrel feeder, they relay pictures back to a monitor in the main car park so people can see the red squirrel close up without disturbing them. 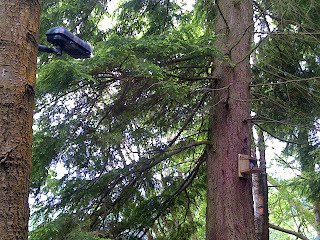 Here the camera is pointing at one of the wooden feeders. 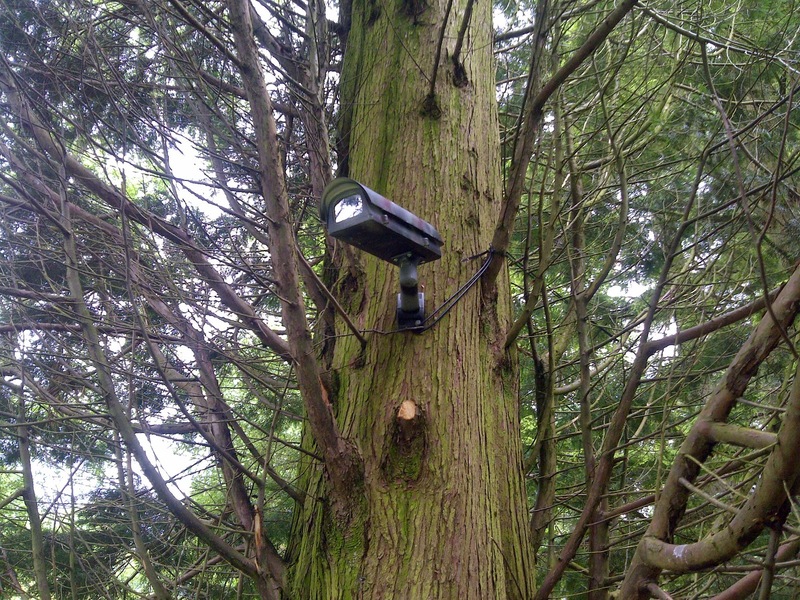 Another of the cameras attached to a tree. This is the monitor displaying the picture in the info shelter in the car park. If we can keep helping the red squirrel by feeding and controlling the greys our visitors will be able to see them for years to come. 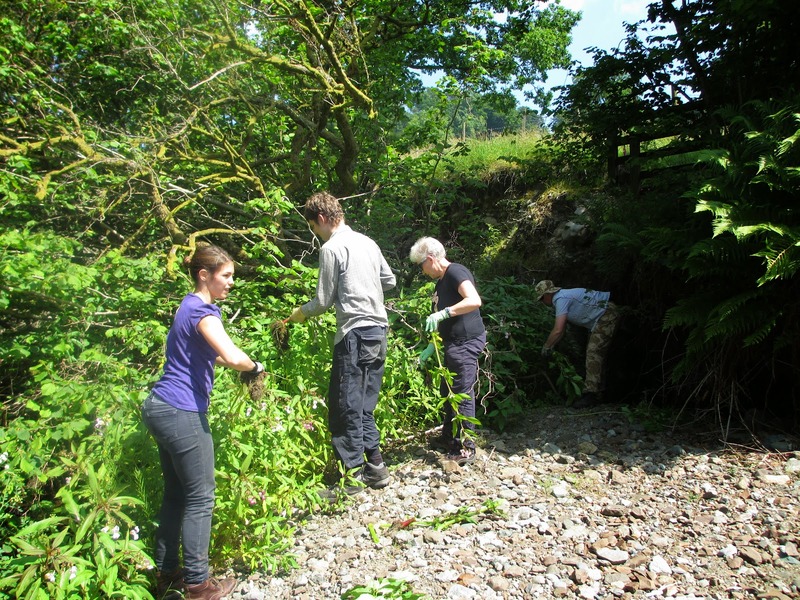 A VOLUNTEER GROUP ON A WORKING HOLIDAY AT AIRA FORCE NEAR ULLSWATER TOOK TIME OUT TO HELP US AT EAST WINDERMERE. 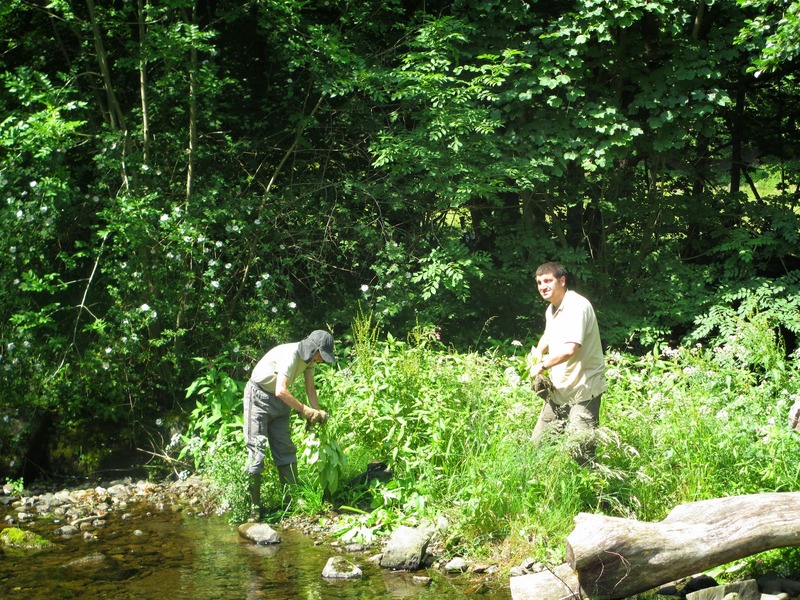 A LARGE STAND OF THE HIGHLY INVASIVE HIMALAYAN BALSAM NEEDED TO BE PULLED OUT ALONG THE STREAM CALLED TROUTBECK. GETTING STARTED ON ONE OF THE LARGER STANDS. 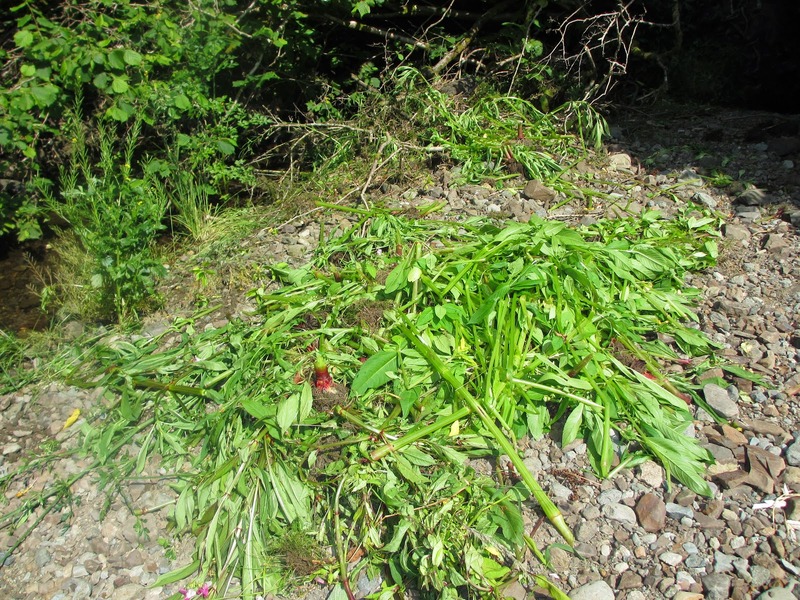 YET MORE BALSAM BEING DEALT WITH. SEPARATING THE ROOT FROM THE STEM. IF THE BALSAM WAS LEFT, IT WOULD HAVE SEEDED BY AUTUMN. 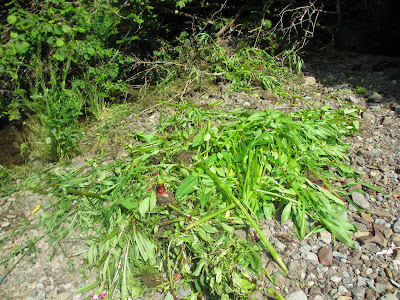 MANY SEEDS WOULD HAVE FLOATED DOWNSTREAM, POTENTIALLY FORMING NEW STANDS OF HIMALAYAN BALSAM. As mentioned in previous blogs, the footpath team's main project of the year has been on the side of Fairfield and as walks home from the work site go, it's pretty special and here's why. Setting off from high on the ridge we look down on to Grisedale Tarn. The tarn is apparently 110 feet deep and holds Perch, Brown Trout and Eels. Legend has it that King Dunmail's crown rests at the bottom of it. Dunmail was supposedly the last King of Cumbria but in 945AD, he and his army were defeated in battle in the valley between Grasmere and Thirlmere (hence the reason it's now called Dunmail Raise) and he lost his life. Survivors of the battle carried his crown to Grisedale Tarn and threw it into the depths believing he would rise up again at some point and retrieve his crown. 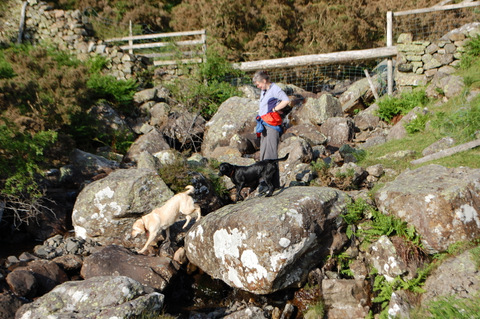 After walking round the side of the Tarn we also have our daily commute downhill via Raise Beck. 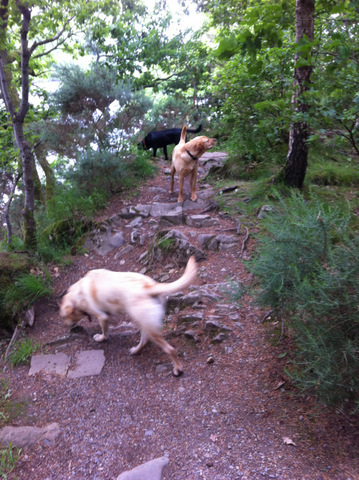 It's a steep walk along a terraced path that traverses along waterfalls and pools. 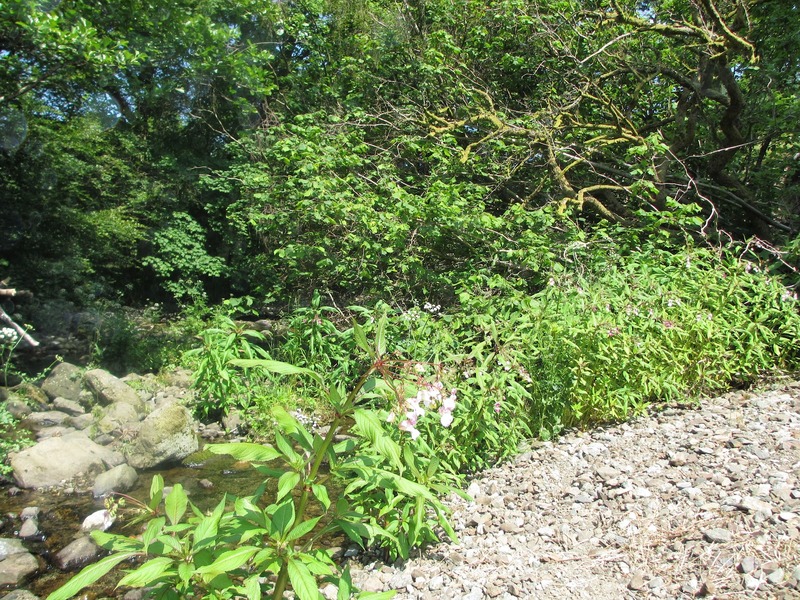 Most of the path is man-made but is difficult to tell because it sits on top of revetment walls which are hidden from view, some of which the team have repaired in previous years. 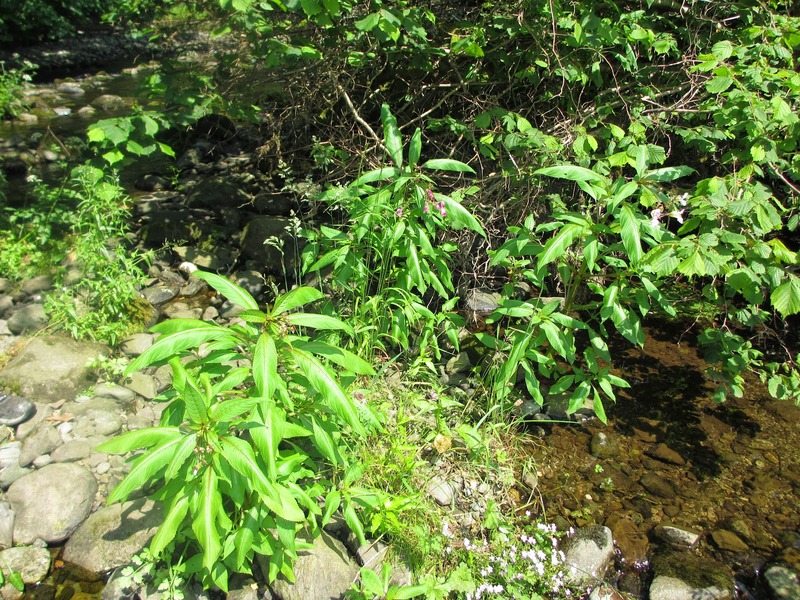 Points of interest on the Raise Beck path include some of the vegetation that grows to the side of the path. Sundew is one of them. This is a carnivorous plant that grows in wet flushes waiting for an unsuspecting insect to land on it. It coaxes insects in by producing a sticky mucilage that they find irresistible and once they've landed on the leaves they can't get away. Death is usually by asphyxiation or exhaustion. The mucilage then begins to breakdown the insect and then the resulting 'soup' is taken in by the plant. Another killer that lurks on the path is the Butterwort. It grows on the damp bedrock and attracts insects in by forming visible droplets on the leaves. Once the insect has landed on the leaf and begins to struggle, the more mucilage is produced by the plant, encasing the insect, thus ending the poor creatures life. 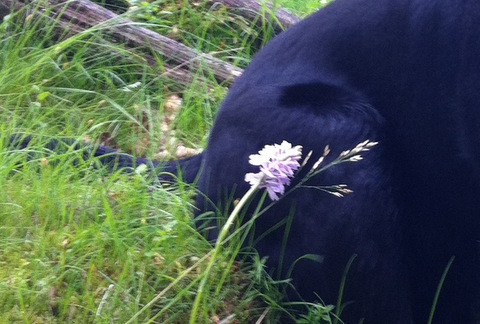 The plant is flowering at this time of year and a purple flower is formed on a very long stem. The reason why the stem is so long is that it hopefully prevents would-be pollinators from getting caught in it's leaves. Very clever. Discussions and planning are now well underway for the Tour of Britain cycle race. In Borrowdale we are going to need as much safe parking as we can find. The police and other agencies have much experience to draw on but we also have to make sure that our Trust tenants can carry on with essential activities. So I’ll be having plenty of discussions with them as plans develop. I’ve mentioned a few times how easy it is to find a quiet space in the Lakes so I thought I’d post a few pictures to show one of them. You will have to find it for yourself though! These are from a recent evening walk and were taken no more than 400 metres from one of the most visited places in the area. 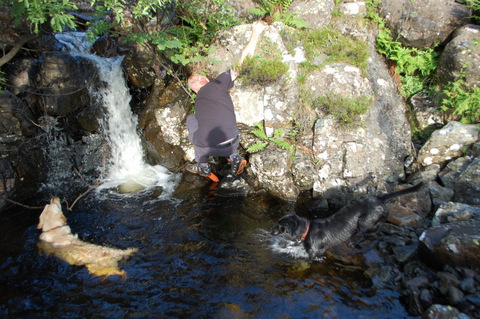 Whilst we were there, Jan noticed some litter (plastic bottles that won’t biodegrade) that had washed into a crevice so I managed to scramble round and retrieve them. I even kept my feet dry! The dogs occupied themselves with swimming. 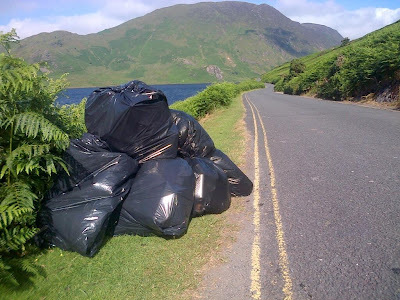 We know that many who walk these places also pick up litter as they go along – that includes regular, local walkers and visiting holiday-makers. It’s great to meet people like the couple in the picture below that we met one day as they were walking along the lake shore. 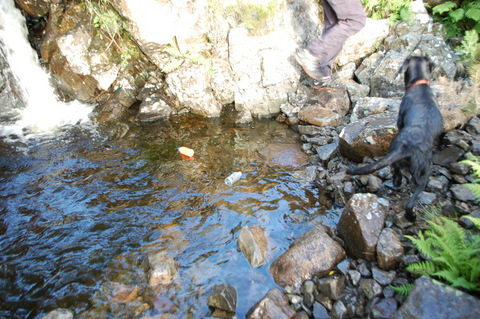 They had found a sizeable plastic container, salvaged it and then filled it with other litter they came across! This kind of care taken by so many contributes enormously to keeping this place so beautiful. They just do it for no recognition and I never meet many of them so I’ll say a big ‘Thank you’ here and hope that some of you read it. 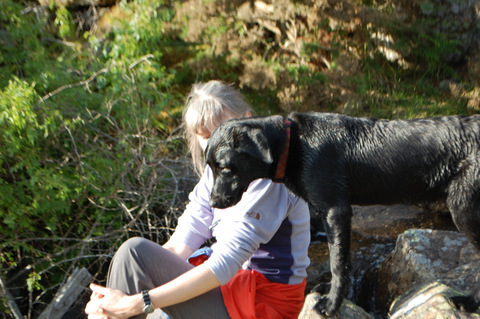 I think my Dad must have had otter in him because I love the water. After several weeks working up at Esk Hause we've now finished the first part of the project. The first section of path has now been replaced with it's improved drainage, and we've also completed the landscaping work. Landscaping is an essential part of the job and is key to getting the path to blend back into it's surroundings. You can see in the photograph below how it looked straight after building the new path and prior to any landscaping. While building the path, large amounts of rubble are generated, and because we were replacing an old path we also had quite a lot of surplus rock to deal with. 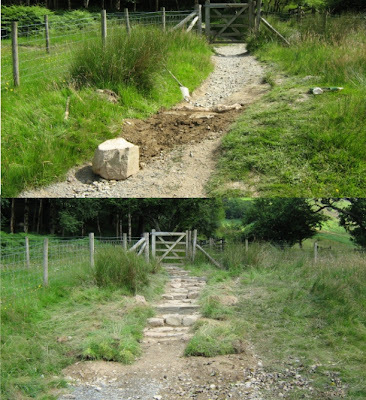 In the photograph below, some of the larger bits of rock have been dug into the edge of the path to discourage people walking there, and also to help the path look a little more natural. Excess rock, and larger bits of rubble have been gathered together and covered over with the soil that was generated while building the path. 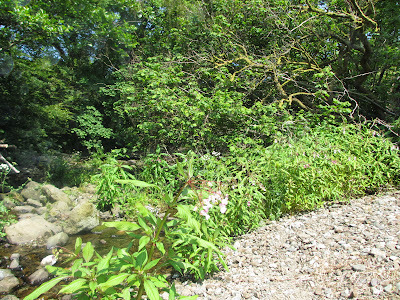 The next photograph shows another section of path before any landscaping work. Again, notice the piles of spoil, rubble and surplus rock. After landscaping, the spoil has been shaped to make it look more natural, it has also been seeded to help stabilize things and start the process of turning the waste back into fell side. 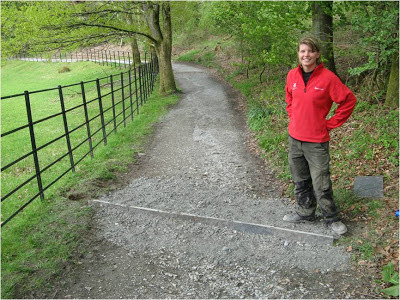 Turfs that were removed while building the path had been kept to one side and have now been used in places along the edge of the path to help stop soil falling back onto the path. It will still take a little time for the vegetation to completely recover, especially somewhere as inhospitable as Esk Hause. But if you use your imagination while looking at the "after" photographs and imagine the soil areas greened over, you can see the effect that we're trying to achieve. We'll no doubt be carrying some more grass seed up to site in future years to give it more of a helping hand, and we'll post some more pictures later on to show how it's developing. I began last week with a trip through to join our Whitehaven Coast ranger Chris to help with the Trust’s contribution to the Whitehaven Festival. This is a very popular event with large numbers of people attending and we had planned some Trust activities. Sadly, the pitch we had was very windy and we had to make the decision that it was unsafe to put up our tent. Despite the wind there was still plenty to do and the crowds clearly had a lot of fun. A couple of days later my volunteers joined me at Calf Close Bay. We cut into manageable sized pieces a fallen Scots pine that had washed ashore. I’ll be busy using a chainsaw to make them into some more seating for the amphitheatre. I’ll post pictures of those when they are ready. The most interesting, even exciting part of my week though was a meeting about the Tour of Britain cycle event that takes place in September. As you can imagine, an event like this needs a massive amount of work to organise so lots of local agencies will be involved with the race organisers. This is a major event for professional cyclists at the top of their game. 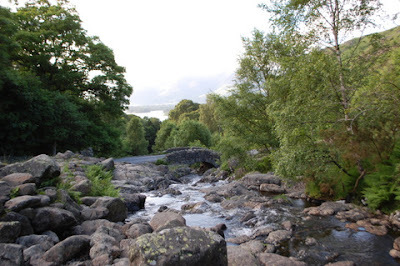 Huge numbers will be coming through the narrow roads of Borrowdale at up to 30 mph (I can probably manage 15 mph!) so there is a lot of planning to be done to make it as safe as possible for both competitors and spectators. I’ll be posting more about Borrowdale plans in the coming weeks but you can find the official tour website here. This is a rare event for an area like this and we want it to be memorable for everybody so we’ll all be busy making it as accessible as possible. I’ve had lots of friends to stay this week – Sunny and Shay. It’s great having lots of friends. “ I’ve bought you some new wheels,” she said with a smile that I couldn’t quite place. With a significant birthday coming up I was hoping that she might have picked up on the non too subtle hints I’ve been dropping about that new road bike . “ top of the range ... German “ she said , oooh German ....precision engineering I thought.... sounds interesting I thought trying to think of German bike companies or German Tour de France winners. “It’s in the garage if you want a look “ . It’s a few weeks until my birthday but I thought ,why not, maybe I could take it for a spin . The Wolf Garten ‘ Ambition’ 48 A HW is indeed top of the range , it’s a top of the range self propelled lawnmower ! complete with Briggs and Stratton engine , red and yellow finishing like a formula 1 car , and it’s own grass collecting box. It carries the name ‘Ambition’ proudly on it’s side . As my ‘ambition’ is to spend as little time as possible gardening , I’m hoping we are on the same wave length. Our garden is definitely showing signs of neglect the grass is longer than it should be the edges are overgrown with brambles , hogweed and dogs mercury, there are waterlogged areas and the ‘lawn’ is at least 50% moss ....... as a National Trust Ranger this could be embarrassing but fortunately for me much of our native flora and fauna thrives on neglect . Our wild wet mossy lawn is covered with traditional woodland and meadow flowers speedwell , self heal, yellow pimpernel, meadowsweet and eyebright . These plants were once common in our hay meadows, but due to changes in farming methods , the greater use of fertilisers and the move from traditional hay to silage as winter fodder for the livestock they have become much less common . In Britain we have lost 97 % of our traditional hay meadows in the last 60 years and along with them birds like corncrakes and harvest mice once a common site in our countryside are now rarely seen , meadow flowers now only survive on ‘neglected’ patches of ground and road verges . Fortunately Hill Top farm in Near Sawrey ( the first farm that Beatrix Potter bought in the Lake District ) has some of those few remaining hay meadows and this week we have been monitoring the health of the meadows . I’ll be honest it’s not the most unpleasant job that we Rangers have to do , it involves wandering through the meadow with a quadrat ( a small square of wire ) a hand lens and a clip board . Every 10 paces we throw the quadrat down and record what species are found within it. By repeating this exercise ,sometimes up to 120 times ! we slowly build up a picture of the dominant grasses and flowers to be found in each meadow. We can then compare our findings with previous years to see if they have changed over time . The answer in case you are wondering is that the meadows at Hill Top continue to be quite diverse with a wide range of flowers with wonderful names like ragged robin, pignut, mouse ear, yellow rattle , farmers knee and ox-eye daisy. These names are so great that I actually just made one up and your not sure which one it is are you ! If you want a bit of wild flower action in your own garden my advice is give the lawnmower a rest and get out on your bike more ! Leave an area to go wild , cut and remove the grass once a year and see what develops, it might be more than just your calf muscles ! 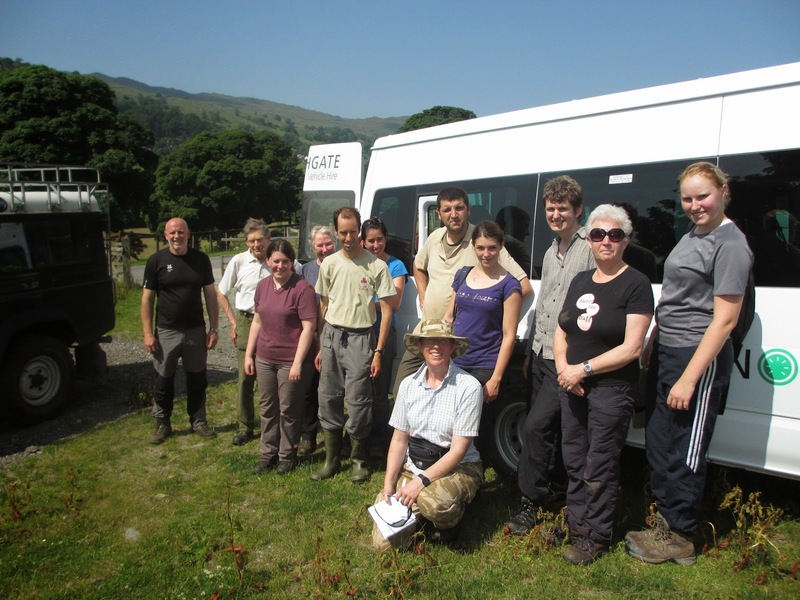 The National Trust owns and manages several important prehistoric sites in the Lake District. Castlerigg stone circle is probably the most famous. 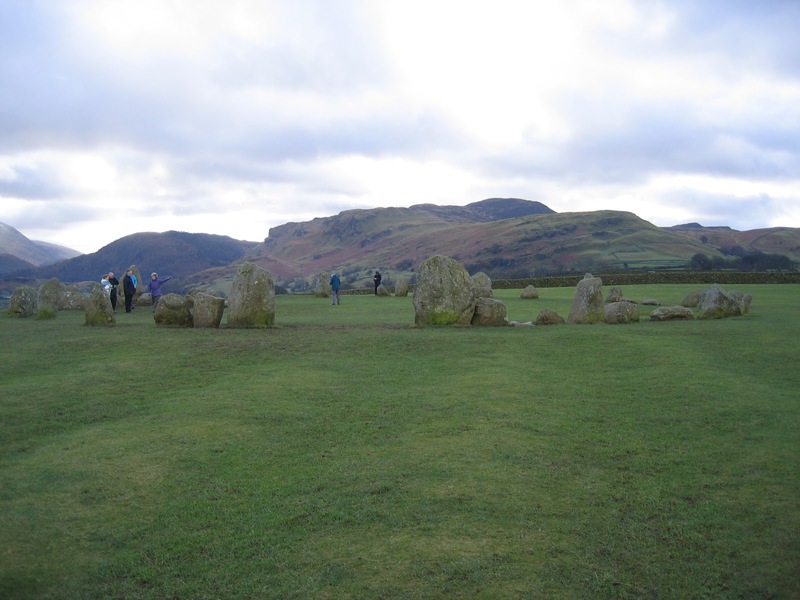 Situated just outside Keswick, Castlerigg is thought to be one of the earliest stone circles dating back to the late Neolithic around 3200BC. To the north of Penrith is Cumbria's largest stone circle, Long Meg and her Daughters. On the tallest standing stone is some impressive art-work (known as rock art) consisting of carved spirals and concentric rings. This site is privately owned but easily accessible to the general public. There are known to have been in excess of 75 prehistoric stone circles in Cumbria although several have now been destroyed because of religious beliefs or/and used for building materials. It was believed that a circle was also present in Grasmere but it's exact location is unknown. Recently one of our keen eyed rangers discovered some new rock art on a rock outcrop just outside the grounds of Allan Bank. These designs are known as "cup marks" and are the simplest form of rock art that can be commonly found. Maybe not as impressive as the spirals of Long Meg but nonetheless an important part of our cultural heritage. Over in Great Langdale there are more fine examples of rock art. Copt Howe, also known as the Langdale Boulder is situated just outside Chapel Stile and has a variety of different motifs including both cup marks and concentric circles. It's been suggested that thousands of years ago it was used as a way marker to the Langdale "Axe Factories" on the Langdale Pikes, where stone axe heads were once crafted on an industrial scale. These axes were of enormous value and were traded right across the country and Langdale axes have even been discovered in central Europe. It is thought by some that one of the uses of the stone circle at Castlerigg may have been for the trading of these axe heads. In more recent years Copt Howe has become a place of pilgrimage for climbers and boulderers wanting to hone their climbing abilities. 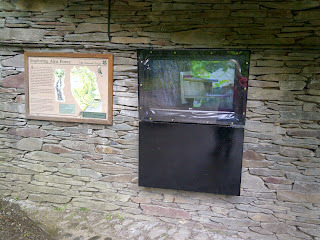 Another piece of rock art can be found in a small wooded area behind the National Trust campsite in Langdale. Although the views are now hindered somewhat by the trees, this boulder would have once afforded fantastic views towards the the Langdale Pikes once again pointing to the importance of the axe factories in these days gone by. All these sites are well worth a visit and only a few minutes walk from the road. Next time you're in the area why not pay them a visit and stand in the footsteps of prehistoric man? It’s seven weeks into my internship and I’m really beginning to find my feet and feel part of the team here. So what does an intern do? Well a bit of everything really. I’ve spent time with all the different ranger teams and it’s been a real insight into what rangering is. There’s plenty of practical work to be done with a lot of grass to be cut around visitor sites at this time of year, especially Wray Castle – a job we all grumble about, but that I secretly enjoy! Endless dry stone wall gaps to be repaired; fencing to take down and put up; a boardwalk to put in and I’ve had great fun driving all the different vehicles to and from work sites, which are much bigger than anything I’ve driven before! 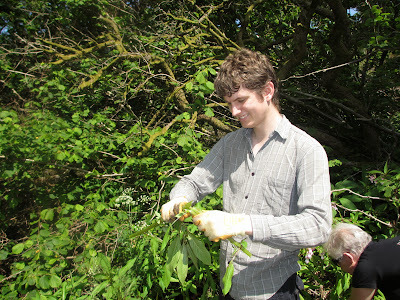 But it’s not all practical work and I’ve been helping out with volunteer groups and attending meetings too, as well as learning about plant identification and going out surveying the hay meadows around Hill Top. It’s been an exciting month and a half and I’m looking forwards to getting stuck in to the next six months. post by intern Leila .